Do you remember the day you came to saving faith? Perhaps you’re still considering a relationship with Jesus. Perhaps you can’t even remember a time when you didn’t know Him. For me, it was on a summer night when I was fourteen years old. When I think about how God brought me out of a home filled with alcohol, rage, and hostility into this wonderful relationship with Jesus, I’m amazed. The sheer wonder of it stokes my passion for Jesus and gratitude to God every time I tell it. But here’s what you need to know. Just because I became a Christian when I was fourteen, does not mean that my feelings of inferiority, insecurity, and inadequacy went away—the girl who had a filter of worthlessness over her mind and heart. When I made the decision to believe in Jesus Christ as my Lord and Savior, those feelings did not dissolve like springtime snow. As a matter of fact I didn’t even know those chains were there. I simply knew that something wasn’t quite right. I was held hostage by my self-perceived deficiencies and didn’t even know it. After the initial excitement of making a commitment to Christ settled down a bit, I actually felt a little worse about myself. (I’m being honest. I always will.) Now I added a new “I’m not good enough” to the list of my inadequacies. I’m not a good enough Christian, I decided. I can’t memorize Scripture like other people or pray like other Christians. I keep struggling with the same old insecurities. I know God loves me, but I don’t think He likes me very much. Why should He? I don’t like me much either. The problem was, as the song says, I was stuck on a feelin’. I walked through life prodded by my emotions rather than led by the Truth. Through the years, I learned to compensate for my insecurities and self-perceived inadequacies. However, if you had seen me as a teenager—my achievements and accomplishments—you would have never known that I felt that way about myself. Even though I had the borders of the puzzle in place with the promise of heaven, I felt like I was missing key pieces to complete the picture. From the time I was fourteen until I was in my early thirties, I always felt like there was something wrong with me spiritually. I had an uneasiness—like I had walked into a movie twenty minutes late, trying to figure out what was going on. I wondered why I struggled to live the victorious Christian life. By my mid-thirties, I had a wonderful husband, an amazing son, and a happy home life. I attended Bible studies and even taught a few. But in my heart, I knew something wasn’t quite right. I wonder if you’ve ever felt that way. Simply put, I was stuck. I was stuck in my spiritual growth and the harder I spun my wheels, the deeper they sank in the muck and mire of the land of in-between—saved from slavery of Egypt but never quite making it to the Promised Land. And then God brought another woman into my life to shimmy the plank of truth under my tires and help me get on my way. God wants to show you truths about your true identity, His timeless sufficiency, and your pre-ordained destiny that flesh and blood cannot reveal. He sits by the well waiting for you to show up—to dip down deep and pour out the affirmation you’re thirsting for—affirmations that call you to let go of the hindrances that hold you hostage, take hold of the promises that set you free, and live bold with that faith you’ve always longed for. He’s looking for men and women who are not only willing but hungrily yearning to step outside of the quiet, settled, predictable faith and into the boldly believing, courageously confident, and miraculously powerful adventurous faith. Those who will take hold of what they’ve already got—of what Jesus has already taken hold of for them. One thing that you have is a new identity in Christ. You are reconciled through Christ’s life. You are justified by Christ’s blood. Today, take hold of these truths and allow God to transform your mind. You are not meant to simply hang on by the skin of your teeth until Jesus comes or calls you home. You are meant to let go of the past, move forward in the present, and live bold! God, thank You for saving me! Not a day goes by that I am not grateful for the way You rescued me from the domain of darkness and transferred me to the kingdom of Your Son. But sometimes I get stuck on a feeling. I get stuck feeling more like the old me than the new me. Help me to let go of my feelings of insecurity, inferiority, and inadequacy and take hold of the truth of who I am as a child of God. Did you notice that today’s truth has an exclamation mark after it? I didn’t put it there, Paul did. Why do you think he did that? Click on this link to see a comprehensive list of you true identity as a child of God. Which one gives you the most hope? Which one is the most difficult for you to believe? Even though it may be difficult, is it true? I’m hoping you said “yes.” Now, take hold of that truth. Click over to my Facebook page and declare one truth about your new identity as a child of God. But a mediocre, mundane faith is not your destiny! In Take Hold of the Faith You Long For, I reveal the most common reasons we get stuck in our Christian faith. 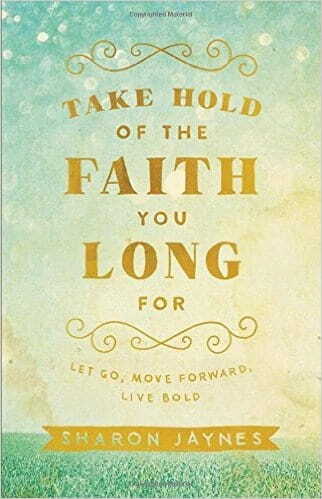 I show you how to break free of all that holds you back, move forward with all that God promises, and live the adventurous faith of bold believing. It’s time to leave behind feelings of inferiority, insecurity, and inadequacy that hold you hostage and take hold of the mountain-moving faith God intends. Let’s uncover untapped sources of confidence and courage, and see how to move from simply knowing the truth to actually living it out boldly in a life marked by true freedom and expectancy. It’s time to get UNSTUCK! Click on the book cover to discover free bonuses when you order before May 1.